Her Majesty The Queen and Their Royal Highnesses The Crown Prince and Crown Princess were also in attendance to welcome the Icelandic president and his wife. 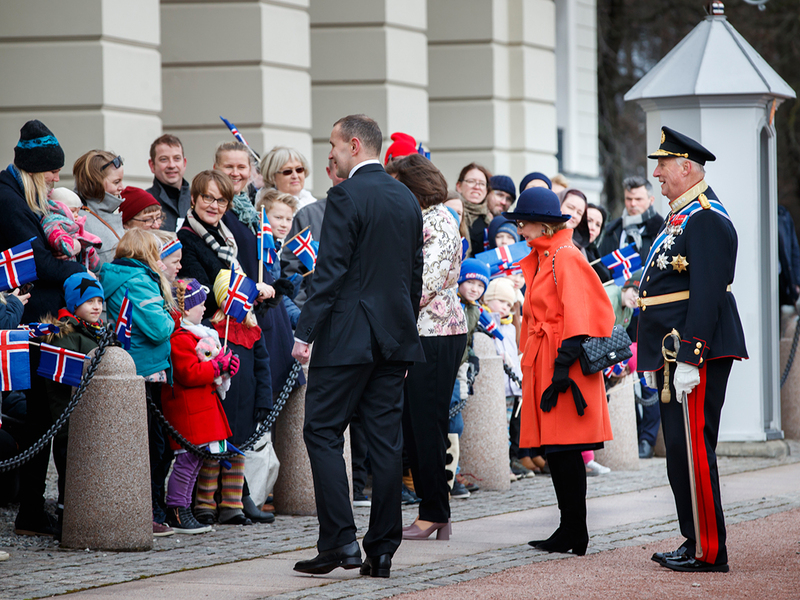 This marks the third State Visit from Iceland during King Harald’s reign. Mr Ólafur R. Grimsson and Ms Vigdis Finnbogadóttir visited Norway during their terms as president, in 1997 and 1992 respectively. Over the next few days, the visit will strengthen the excellent ties between Iceland and Norway by focusing on the countries’ shared cultural heritage and ways to further develop cooperation in the areas of culture, education, research and innovation. The formal welcoming ceremony in the Palace Square traditionally initiates all State Visits to Norway. Today the Norwegian and Icelandic flags adorned the square, extending all the way down the Palace Hill and Karl Johans gate. 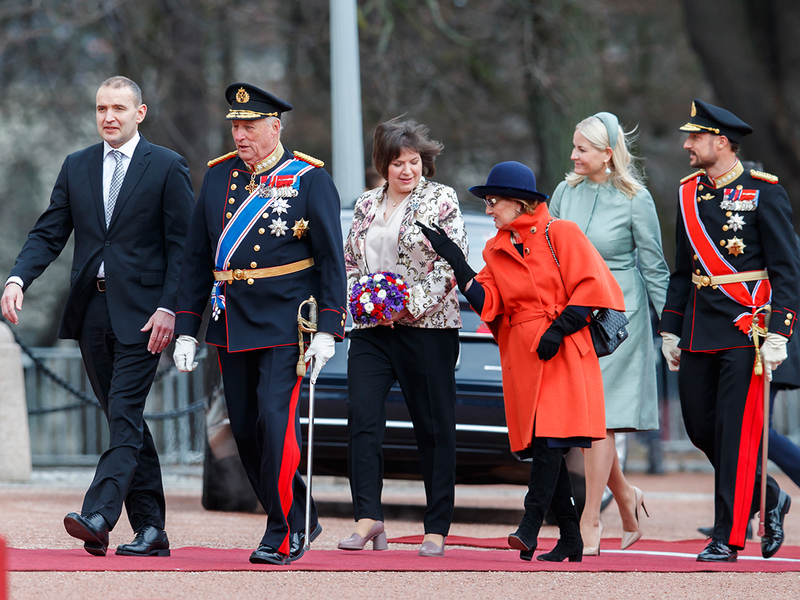 President Jóhannesson and Ms Reid were accompanied by Crown Prince Haakon to the Palace Square, where they were greeted by King Harald. 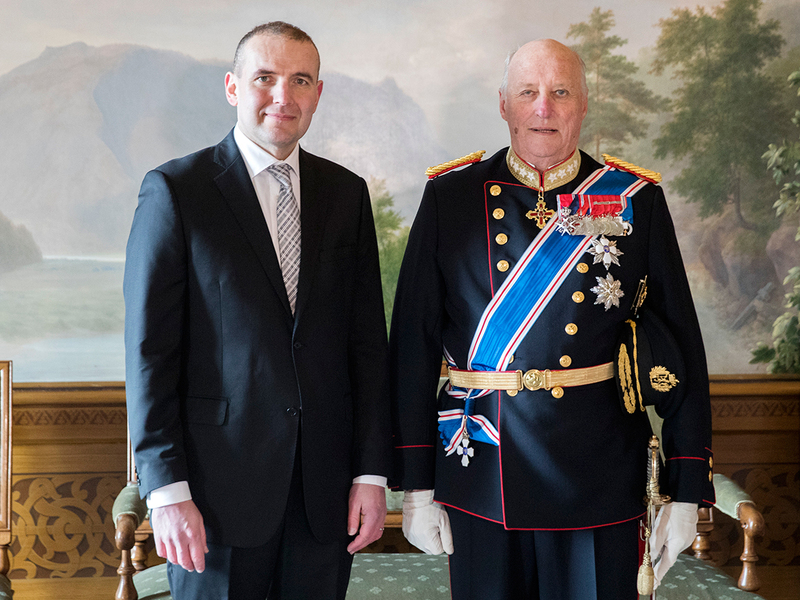 His Majesty The King’s Guard played the national anthems of Iceland and Norway, after which President Jóhannesson inspected a Guard of Honour from His Majesty The King’s Guard, accompanied by King Harald. 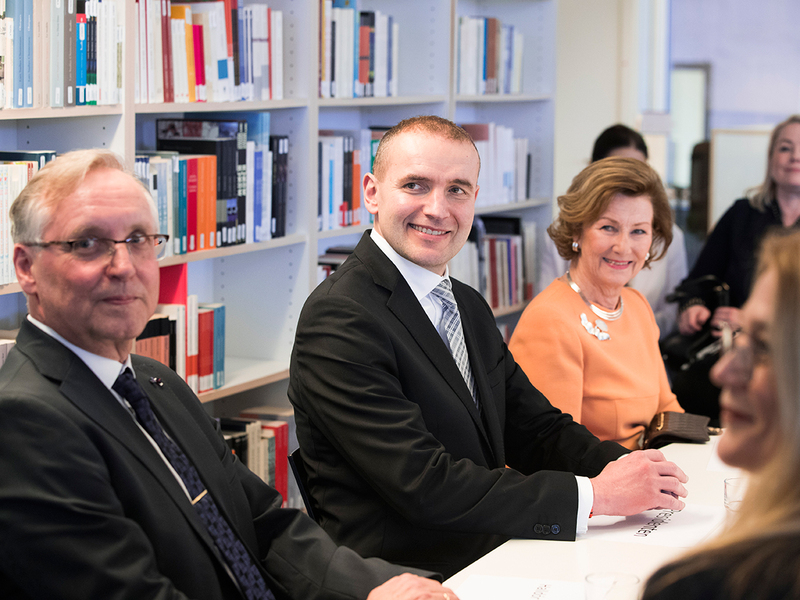 The President and First Lady of Iceland were then introduced to representatives of official institutions in Norway. They also took the opportunity to speak with members of the Icelandic community in Norway and with some of the children who had come to watch the ceremony. 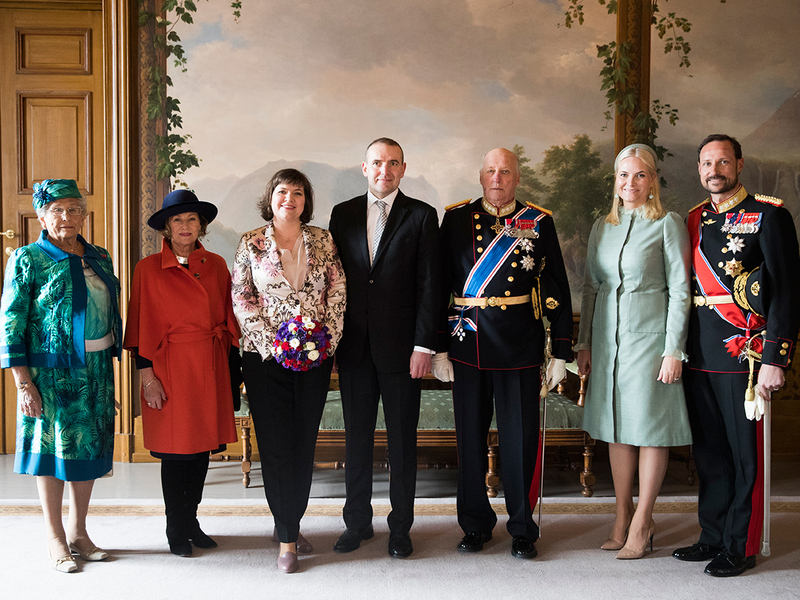 Her Highness Princess Astrid, Mrs Ferner was waiting inside the Royal Palace, and joined the others for official photographs in the Bird Room and an exchange of gifts in the White Parlour. Following the welcoming ceremony, King Harald accompanied President Jóhannesson to Akershus Fortress where the President laid a wreath at the national monument commemorating the Norwegians who lost their lives in the Second World War. Queen Sonja and Ms Reid were also in attendance, and the President inspected another Guard of Honour from His Majesty The King’s Guard. President Guðni Th. Jóhannesson laid a wreath at the national monument at Akershus Fortress. Photo: Sven Gj. Gjeruldsen, the Royal Court. The Frankfurt Book Fair is the world’s largest marketplace for literature and media. It is held every year in October, and each year one country is highlighted as a Guest of Honour. Norway was selected to be the Guest of Honour for 2019, and will have the opportunity to present Norwegian literature and culture at the fair, which attracts over 10 000 journalists, 7 000 publishing houses and 300 000 visitors. Norwegian Literature Abroad (NORLA) promotes the export of Norwegian literature and is in charge of planning the Norwegian programme for the 2019 Frankfurt Book Fair. NORLA hired Icelandic Halldór Gudmundsson to serve as project manager for the process leading up to 2019. Mr Gudmundsson headed the initiative when Iceland was the Guest of Honour in 2011, and therefore has unique expertise and experience. Together with the Director of NORLA, Ms Margit Walsø, he presented the project to the King and Queen and the President and First Lady. 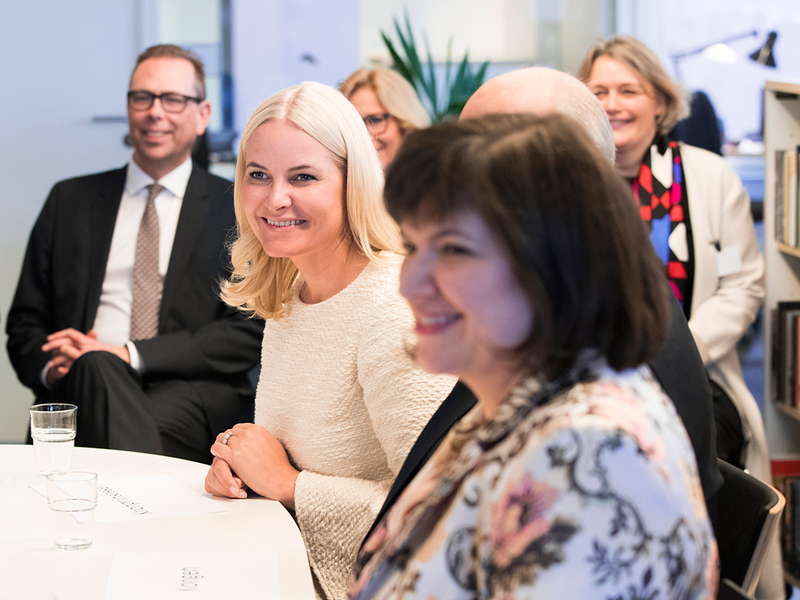 Crown Princess Mette-Marit, who has a keen interest in literature, was also in attendance. Both the President of Iceland and the First Lady have given speeches today. 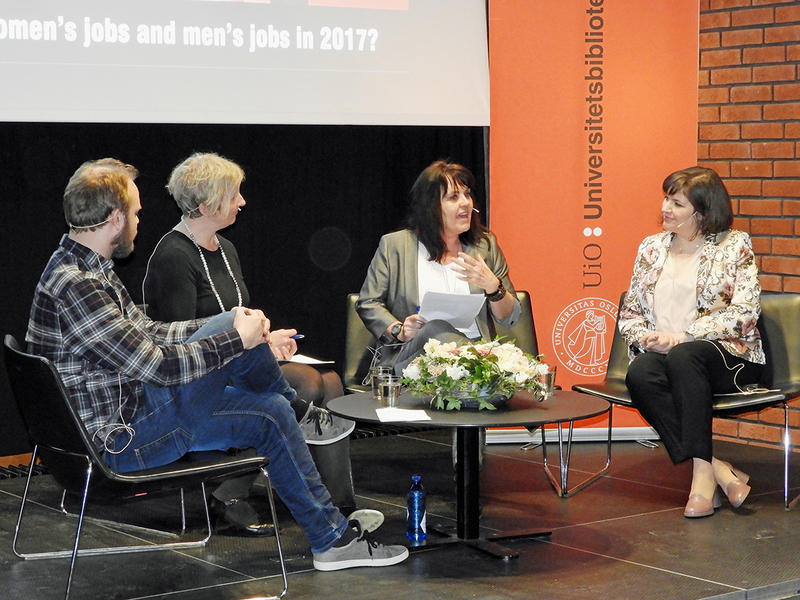 In the morning, Ms Reid, accompanied by Queen Sonja, spoke at a seminar at the University of Oslo entitled “The workplace of 2017: The gender-divide in the age of equal opportunities”. Her speech, “I dare, I can, I will: The challenges and victories of gender equality in the Icelandic workplace”, was followed by a panel discussion, in which Ms Reid also took part. In the afternoon, President Jóhannesson spoke at the closing session of the conference “Global Challenges – Nordic Experiences” in the University Aula. King Harald, Queen Sonja and Ms Reid were in the audience as the President gave his speech entitled “What challenges? What opportunities? The future of the Nordic model”. 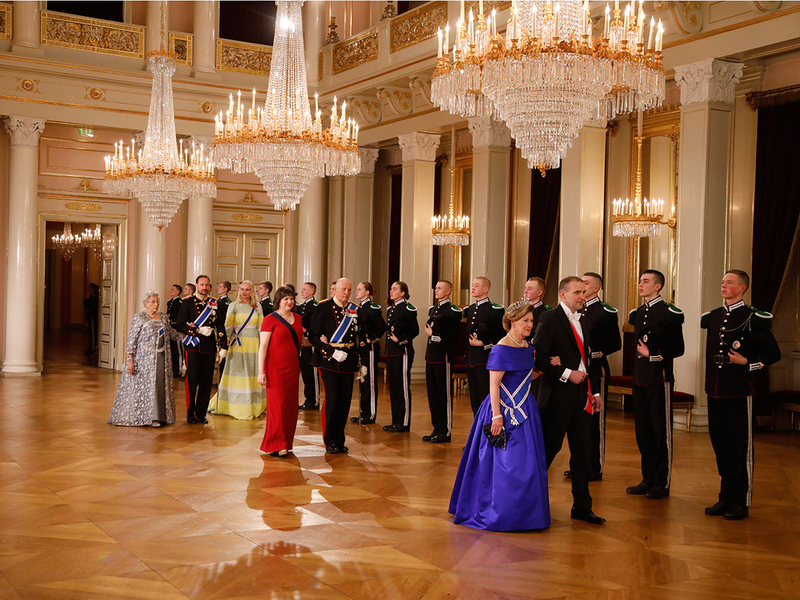 In the evening, a gala dinner is being held at the Royal Palace in honour of the State Visit from Iceland. King Harald and President Jóhannesson will both give speeches during the dinner, which will be prepared in the Palace kitchen using Norwegian raw ingredients. The menu will be made public at 20:00 CET, when the company takes their seats. 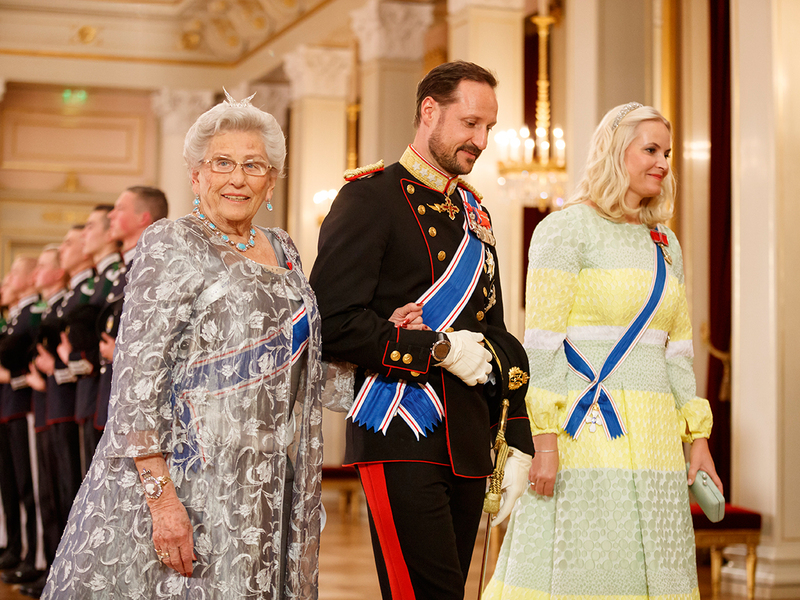 The Crown Prince, Crown Princess and Princess Astrid, Mrs Ferner will also be in attendance, along with representatives of official institutions in Norway. The banquet will bring together guests from cultural, political, research, educational and business circles who have ties to Iceland. The table has been laid for 184 guests in the Banqueting Hall this evening. 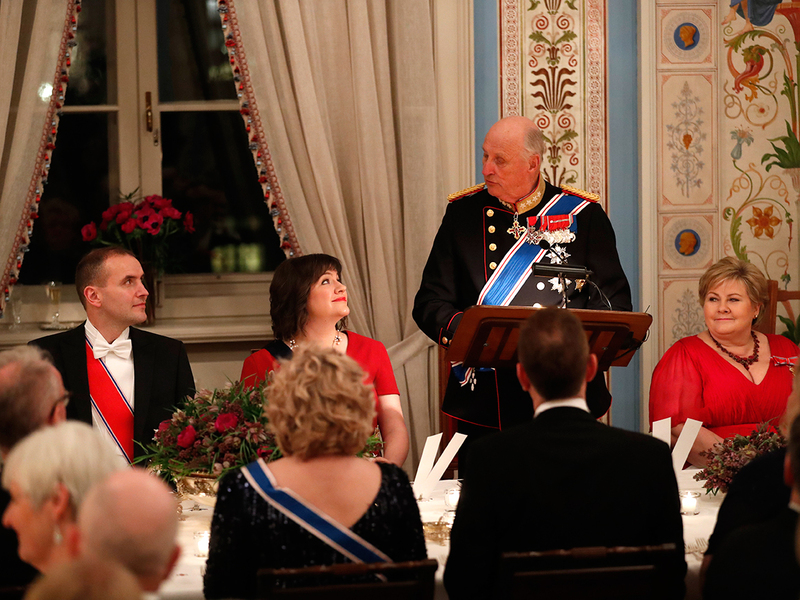 King Harald's speech in honour of the President and First Lady of Iceland. Photo: Cornelius Poppe, NTB scanpix. Video: NRK. 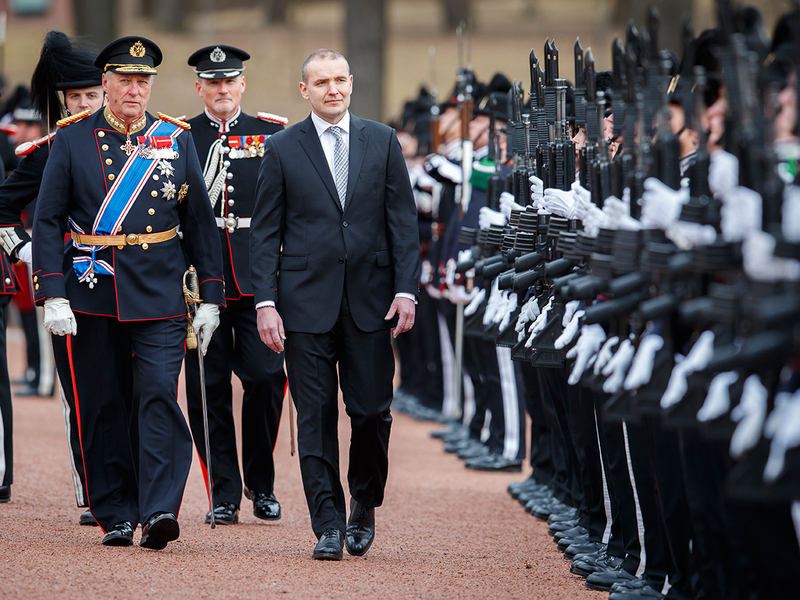 President Jóhannesson inspected a Guard of Honour from His Majesty The King’s Guard, accompanied by King Harald. Photo: Heiko Junge, NTB scanpix. The President and First Lady of Iceland are greeted in the Palace Square. Photo: Heiko Junge, NTB scanpix. They also took the opportunity to speak with some of the children who had come to watch the ceremony. Photo: Heiko Junge, NTB scanpix. 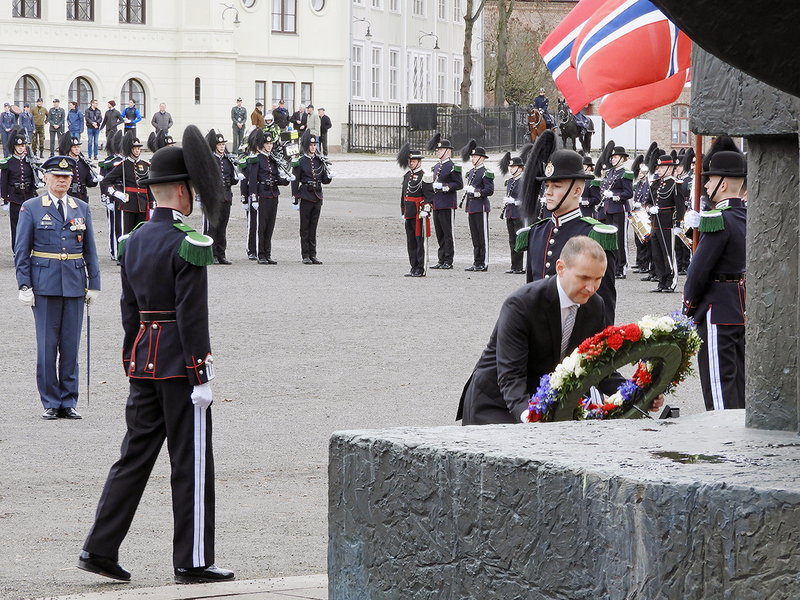 The President laid a wreath at the national monument commemorating the Norwegians who lost their lives in the Second World War. Photo: Sven Gj. Gjeruldsen, the Royal Court. Ms Reid spoke and took part in a panel discussion on gender equality in the workplace. Photo: Sven Gj. Gjeruldsen, the Royal Court.